In this post we’ll look at troubleshooting WMI errors. Fixing every potential WMI issue is beyond the scope of this blog series, but what we can do it run the WMIDiag utility on the client machine, and this is very helpful to diagnose potential issues with WMI. The report generated by WMIDiag contains advice on how to resolve the WMI errors it finds. 0x800410xx and 0x800440xx are WMI errors. These error codes mean that a specific WMI operation failed. This could be due insufficient privileges to perform the WMI requested operation; due to the nature of the request itself (for example, no WMI rights, bad WQL query); or due to a WMI infrastructure issue, such as CIM or WMI DCOM registration preventing a provider from being loaded. 0x8007xxxx are Win32 errors, not WMI errors. WMI may return these types of error due to an external failure (for example, DCOM security). 0x80040xxx are pure DCOM errors, not WMI errors. WMI may return these types of error due to an external failure (for example DCOM configuration). 0x80005xxx are ADSI errors (LDAP), not WMI errors. WMI may return these types of errors due to an external failure, such as an Active Directory access failure when using the WMI Active Directory providers. If a true WMI error is suspected, we can run WMIDiag on the machine using Powershell. Download WMIDiag from Microsoft and place the 3 files on a network share. Since WMIDiag must be run locally, the script will copy the WMIDiag.vbs to the remote machine and start it. $CMTrace = The path to the CMTrace utility used for viewing the resulting log file. Text file. This contains a summary of the health of the WMI. Log file. This contains the full output of the WMIDiag tool. The script will copy these files from the client to the file share, then open the text file using the CMTrace utility for easy viewing. This script will run WMIDiag on a remote machine and opens the text report with CMTrace to review the results. Write-Host "Creating local directories if needed..."
Write-Host "Copying logs to server..."
Some advise to delete and recreate the WMI repository, and this will generally fix a WMI issue, however it can affect other applications, so it’s recommended to be a last resort. A more friendlier way to repair the WMI is to use Roger Zander’s SCCM Client Center, which has a Repair WMI option, and in the 2012 version it works even when you cannot connect to WMI on the machine because it uses winRM. That’s it for now! Hopefully these posts will help you troubleshoot and fix many of the common issues that occur with ConfigMgr client upgrades. In this post, we’ll look at another cause of ConfigMgr client upgrade failure – the SMS Task Sequence Agent service is running. It can sometimes happen that a task sequence gets ‘stuck’ and never completes, but the SMS Task Sequence Agent service (smstsmgr) is started and never stopped. Usually I have found that it ‘freezes’ because it is waiting for software updates to pause before it can continue, and for some reason that doesn’t happen. A similar issue is described in this post: http://setspn.blogspot.co.uk/2013/07/sccm-task-sequence-software-updates.html?sm_au=iVV7Sp7LVprV5k7F. Usually I use the ‘reset the Paused SW distribution cookie’ option in Roger Zander’s SCCM Client Center to remedy that. If the SMS Task Sequence Agent service is running when the ConfigMgr client installation process attempts to uninstall the previous client, it will fail, and stop the entire process. The ccmsetup.log contains a line near the end that says ‘installation failed with error code 1603‘. Error code 1603 is ‘fatal error during installation’. The following Powershell script can be run against a machine where to identify if it has this problem. It will search the log files for the error string, and report if it finds it or not. Ths script searches the client.msi_uninstall.log on a remote machine to identify if the "ERROR: Failed to stop the 'smstsmgr' service" line is present in the log. write-host "The error 'Failed to stop the 'smstsmgr' service' is NOT present in the client.msi_uninstall.log on $ComputerName." The resolution is to stop the SMS Task Sequence Agent service on the client machine by killing the ‘tsmanager.exe‘ process. You can then push-install the client again from the SCCM Console, or you can trigger it manually from the client itself using process described below. The following Powershell script will detect if the tsmanager process is running and kill it if it is. Enter the computername in the variable. Ths script checks whether the 'Task Sequence Manager' process is running on a client machine and kills it if it is. For troubleshooting SCCM client upgrade issues. Write-Host "tsmanager process does not exist"
Once you have killed the tsmanager process, it is possible to manually trigger the installation of the SCCM client remotely using Powershell. This uses the ccmsetup.exe file that has already been copied to the machine. But first you must kill any existing ccmsetup process and service. This script will do that. Enter the computername in the variable. Ths script checks whether the 'ccmsetup' service is present on a client machine and deletes it if it is. write-host "ccmsetup service is $status"
$service = Get-WmiObject -ComputerName $ComputerName -Class Win32_Service -Filter "Name='ccmsetup'"
Write-Host "ccmsetup service does not exist"
This script will trigger the installation of the SCCM client from the ccmsetup.exe already copied to the machine by a previous push-installation attempt. Enter the computername in the variable, and the SMS Site Code at the relevant place. Ths script remotely triggers an SCCM client upgrade installation from files already cached on the machine. Write-Host "Starting SCCM Client installation on $Computername"
In my environment, I included these activities in the Client Checks script we ran previously, so if this error was detected, it would be automatically remedied. This makes troubleshooting a lot easier! Next time, we’ll look at WMI issues. In this post, we’ll start looking at some of the common reasons why client upgrades fail, and how to resolve them. If the client computer has the Windows firewall turned on and the required exceptions are not made, then it may report in the CCM.log on the site server that it couldn’t connect to that machine. The windows firewall requirements are documented here: http://technet.microsoft.com/en-us/library/gg682180.aspx. In many cases, the reason the ConfigMgr client did not upgrade is simply because the client machine is not currently online. ConfigMgr will try every hour for 7 days to push the client again. If it hasn’t succeeded in this time period, it will give up, therefore if the client has not been succesfully installed or the problem remediated during this time period, you will need to push the client installation again from the ConfigMgr console. You can push it to the entire collection that contains computers without the SCCM 2012 client, if desired. —> ERROR: Unable to access target machine for request: “2097156880”, machine name: “DB-MyLaptop”, access denied or invalid network path. In some cases, there are stale computer accounts in Active Directory, for example the machine was rebuilt with a different name, and was not first removed from the domain. There may also be stale computer records in ConfigMgr, depending on the defined period of the maintenance tasks that clear out old records. In these cases, the client records should be removed from AD/ConfigMgr. If the client is not properly registered in DNS, ConfigMgr may report that it cannot connect to the machine in the CCM.log. For example, I had one such case where I could ping the machine and I could connect to the admin$ share by it’s IP address, but not by it’s hostname. After searching in DNS I found multiple A records for different hostnames associated with the IP address! So after deleting the additional A records and flushing the DNS on the SCCM site server, the client push install went through successfully. Install SP3 or upgrade the machine to a newer OS to install the 2012 client. —> Unable to connect to WMI on remote machine “”DB-MyLaptop””, error = 0x80070057. This error code means ‘The parameter is incorrect’. When you run wbemtest utility and try to remotely connect to the WMI on that machine, you get the same error. By default, it should look like the screenshot below. 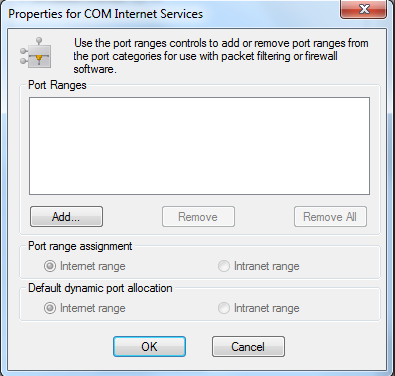 If it is using the ‘Intranet range’ and no port ranges are assigned, then you probably have this problem. Actually, there was nothing much wrong with the WMI on that machine, and the problem wasn’t with WMI, neither in the DCOM security, which was all set correctly. It turns out that the DCOM ‘Connection-oriented TCP/IP’ protocol was set in the registry to use InternetPorts, yet no ports were defined, therefore no connections were being allowed. It has to be created manually, and this can be done to allow RPC communication on pre-defined ports, as described in the Microsoft KB: http://support.microsoft.com/kb/154596. This is usually done for security reasons. But if the keys are not created correctly, for example you create the ‘UseInternetPorts‘ key, but don’t create the corresponding keys to define which ports are to be used, then RPC communication to that machine will fail. In the case that you are not intentionally using pre-defined RPC ports, then simply delete the registry key HKEY_LOCAL_MACHINE\SOFTWARE\Microsoft\Rpc\Internet and all it’s subkeys, then reboot the computer, and RPC access will be restored. You can use this Powershell script to delete the registry key on a remote computer. It will also get the logged on user, so you can ask them to reboot their machine. It must be run as administrator, and with an account that has local admin rights on the remote computer. write-host "$Path exists in the registry on $ComputerName. Attempting deletion of key..."
write-host "$Path could not be deleted!" write-host "$Path does not exist in registry on $ComputerName"
Next time we’ll look at another cause of ConfigMgr client upgrade failure. In this post, we’ll run a Powershell script that will perform the client checks we discussed in the last post, against multiple machines that failed to install the ConfigMgr client. Note, all the scripts in these posts are designed to run in Powershell ISE. The first thing we need to do is to put all the machines that don’t have the SCCM 2012 client installed into one collection, so we can work with them all at once. Now that you have the collection, you can run the Powershell script below against that collection. Powershell remoting must be open on the ConfigMgr Site server. The subfolders with the computer names contain the ccmsetup log files from the client machine. You can review these using the CMTrace utility to find any errors. The report.csv contains the results of the checks against the client machine. Open it in Excel, and filter the ‘Machine is Online’ column to show only those machines that are online. These results, together with the client log files and the CCM.log on the site server, will help you identify where the problem is occurring with each client. Since the ConfigMgr Client Push method will attempt to push the SSCM client to the machine every hour for 7 days, if the machine is still not online or the problem is not remediated with the 7 days, you will need to push the client again. This can be done to the entire collection at once using the SCCM Console. In the next post, we’ll look at some common reasons for client upgrade/installation failure, and how to remediate them. This script performs inital client checks on a collection of remote hosts where the SCCM client failed to upgrade/install. $Collection = "All Computers with NO SCCM Client Installed"
write-host "# ConfigMgr Client Upgrade Failure Script #"
write-host "Getting members of '$collection' collection"
write-host "Collection contains $countlocal members"
$location = "$env:USERPROFILE\ClientLogFiles\$(Get-Date -Format yyyy-MM-dd-HH-mm)"
$headers = "Computer Name,Machine is online?,Can connect to admin$ share?,C:\Windows\CCM folder exists?,C:\Windows\ccmsetup exists?,C:\Windows\ccmsetup\scepinstall.exe,C:\Windows\ccmsetup\Logs exists?"